Ken Shane pays tribute to the great Levon Helm. As every lover of good music knows, we lost Levon Helm last week. It’s a loss that many of us are feeling in a very personal way. Not only does the music that Levon made with The Band continue to resonate with us, the music he made and the way he lived his life as a solo artist is inspiring on many levels. I first saw The Band on March 7, 1970. I actually found the poster for the event online, and it’s pictured here. 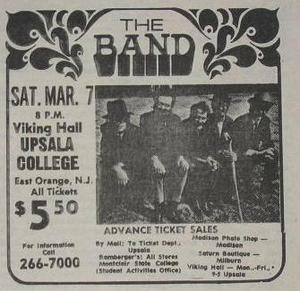 The show was at a now-defunct college in East Orange, NJ called Upsala. What I remember most about that night is how dignified the musicians were. There was no pandering to the audience. There were no shouts of “how’s everybody doing tonight!!!?? ?” from the stage. In fact, they didn’t address the audience at all. Maybe they learned that from Dylan. When I saw him four years earlier, he barely had anything to say either. If your music is good enough, there is no need for inane patter. There were just these five men that long ago night, dressed as if they’d just stepped out of a Civil War photograph. These five men, and the brilliant music they created. Some might have seen them as aloof. For me they were the perfect embodiment of what great musicians should be. I saw The Band one more time. I know it was in Asbury Park, and it was obviously some time before The Last Waltz in 1976, because they were all there that night. But even the almighty Internet is unable to help me with a date for that one. It must have been near the end though, because I remember thinking that their performance that night seemed kind of strained, much less relaxed than they had been in East Orange. The joy had clearly gone out of it for them, and so, for us. Flash forward to the early ’90s, when I reconnected with Levon. He was scheduled to do a show at an ice skating rink in Montclair, NJ with Rick Danko. It seemed like an odd, sad venue for such esteemed characters, and then Danko didn’t show up because he’d been busted in Japan. Levon went on and did the show anyway, and of course he made the best of a tough situation, and everyone went home happy. Then Levon got sick. When I saw him one summer at what was then called the WXPN Singer/Songwriter Festival in Philadelphia he wasn’t singing at all. The cancer had taken his distinctive voice. It couldn’t take his unique drumming skills though, and together with a great band he won the day. Then, against all odds, Levon’s voice was back. His voice was back, but the cancer had nearly bankrupted him. They were getting ready to take his hand-built house in Woodstock away from him. That’s when someone got the great idea for the Midnight Ramble. Every Saturday night people were invited to Levon’s house to hear him and his special guests perform up close and personal. The money that was collected at the Rambles managed to keep the wolf from the door, and suddenly, unimaginably, Levon’s career was reborn. It is important to mention here how the Woodstock community came together to help Levon when he needed their help the most. The reason they did was simple; Levon had been a committed neighbor who never stopped contributing to his community. So those people who volunteered to direct visitors to parking at the Rambles, or take their tickets at the gate, or do one of a thousand little tasks that helped to make the Ramble experience special? They were there for Levon. I finally got my chance to go to a Ramble in 2007. I was there as a journalist to cover the event for a not very prominent New York City weekly, but like everyone else who went, I was treated like a member of the family. I will never forget the kindness that Barbara O’Brien, Levon’s manager (and another Woodstock person who showed up in a big way when Levon needed her), showed to me that night. It was one of the singular musical experiences of my life, and you can read about it here. In the last few years I’ve been able to see Levon at the Newport Folk Festival. He was singing less, and I was concerned, but the shows were so great that any worries were quickly forgotten. I watched with delight as his reborn career rose to new heights with great albums and appearances at prestigious venues like the Ryman Auditorium in Nashville, and the Beacon Theatre in New York. And then it was over. There was the shocking message from his family saying that he was in the final stages of his struggle with cancer. Like most people, I was unaware that the cancer had returned. The news seemed to come like a lightning bolt out of a clear blue sky on a sunny day. Soon, too soon, he was gone. We all read with great emotion about Robbie Robertson’s visit to Levon in his final days. The two men had been at odds for years, but Levon’s end brought a reconciliation that most people thought would never happen. There’s a lesson in there about not waiting to tell people how you feel about them. Now, we do what we do at times like this. We fill our worlds with the music of the departed, and in doing so, we insure that they never really depart at all. We’ve had a lot of terrible losses in recent years, and this is a particularly tough one for me. So I’m just going to close my eyes and turn up the volume.